You can make outbound calls from either your browser or your telephone. Keep in mind that while you can make outbound calls using your telephone, you must initiate the call from within Zendesk in your web browser. Agents can make outbound calls regardless of whether they are online or offline. Click the Talk icon ( ) on the right side of the toolbar. Click the dial pad icon. Click your current number to open the call from drop-down list. You can then select a new number to call from. Enter the telephone number and click Call. 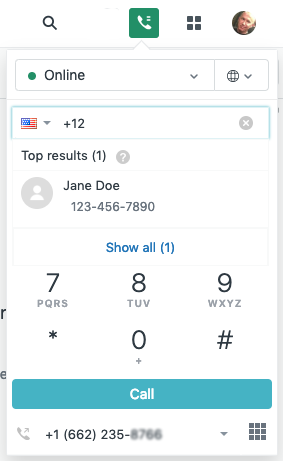 If you're using your phone, Zendesk will call your number and then dial the requester after you pick up. Tip: Although Talk does not support speed dial numbers, it is possible to enter the name of the person you wish to call into the Talk pad, rather than type the number manually, if they are a user in your account. For details, see Can I set up speed dial in Zendesk Talk? Select the ticket you want to use to call the requester. Above the new comment field, click the telephone icon. Select an existing telephone number or click Enter a number to call to manually enter a new number to dial. Click their number in the Phone field. In the drop-down list, select Call this number. Note: If you have not selected a phone number to call from, follow the steps at the beginning of this section. You will receive an error message if you do not select a number. The call console opens and calls the selected number. Is there a way to bulk update our customers phone numbers to include the dial code e.g +44? The other option would be to get your developers involved and use the Zendesk API to bulk update this information. Are you wondering if outbound calls are recorded through talk? If so, as long as you have recording options enabled as mentioned in our Managing recording options in Zendesk Talk article then outbound calls will also be recorded in the ticket. is it possible to have more agents calling (outbound) from the same number at the same time? Or should they have separate numbers? How can we enable international calling? Can I set up speed dial in Zendesk Talk?